There have been so many learning lessons throughout this process, and I know there will only be more to come. But the biggest lesson in all of this is to not be afraid to do something you love. Trust me, it is more than worth it. "What's the point of starting this anyway?" "I'm pretty sure I'm too old for a 'passion project.' "
"I should just forget the whole thing." These were just a few of the thoughts that ran through my mind as I contemplated starting my passion project. You know -- the thing you work on separate from your career that you're extremely passionate about and invested in doing. It could be anything from writing a novel to creating pottery to, in my case, starting a blog. I had been contemplating my passion project for about a year. 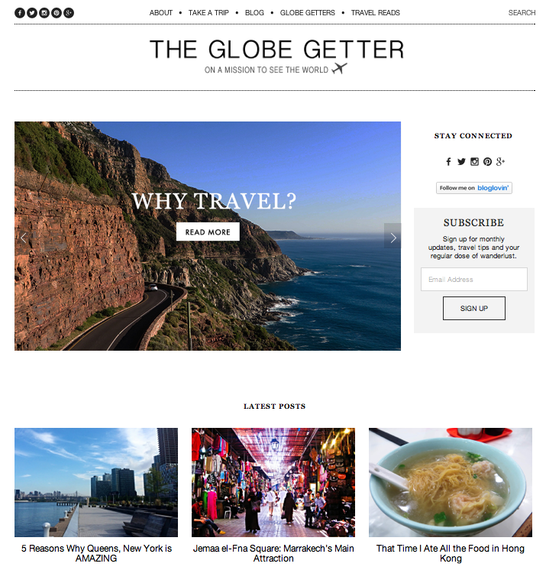 But after hemming and hawing and growing tired of my own hemming and hawing, I finally made the leap and started The Globe Getter, a travel site dedicated to showing you don't need to quit your job or win the lottery to see the world. Let's be real -- the older we get, the more we tend to stay in our comfort zone. Whether it's due to society, family or some other factor (or all of the above), we tap into our discomfort less and less, but the uncomfortable moments are where we begin to grow and push ourselves. When I was starting my website, I had several ideas in my head that I knew required stepping out of my comfort zone in multiple ways. From a technical standpoint, I made myself learn some of the basics of HTML and CSS. I'm far from being an expert, but I feel a little more knowledgeable about an increasingly important skill set. Even the act of talking about my passion project makes me slightly uncomfortable, but I have learned there's nothing to be gained by hiding something that's important to you. Most passion projects tend to be creative in some way, and for many people, that creative side is not given nearly enough attention. The sense of imagination we entertained so much as a child has been stifled, though I don't believe it ever completely disappears. It's often a matter of rediscovering -- or in some cases discovering -- a part of ourselves that we have either locked away or did not know existed. Working on your passion project and pouring your energy into a part of yourself that otherwise goes ignored can be rewarding and invigorating, bringing balance to a life that may be too weighed down by other responsibilities. One of the scariest things about starting a passion project and telling others about it is that there is a certain amount of vulnerability associated with doing this. You're telling others about something that has significant meaning to you, so you feel as though you're exposing a part of yourself, and in fact you are. Some may see this as an easy process but some, like myself, may have reservations. After all, it did take me a year to finally decide to start my website. And once I did I felt the same nervous thrill I feel anytime I know I've truly put myself out there. It's a feeling that many of us don't feel often enough because we are afraid to be too vulnerable. Related to the other things I've learned, I realized that by choosing to do a passion project, I was choosing to invest more in myself. It's not a selfish act, but a restorative one. Too often we give and give and before we know it, we are empty. A passion project allows you to set time aside to focus on something just for you. You're investing in your ideas, your personal goals and your own wishes. We don't do that often enough, but we should know that there's nothing wrong with taking the time to immerse ourselves in something we love. Who knows where it may lead? In starting a passion project, I've learned it's best to adopt the Nike tagline, Just Do It. I am a master at thinking about things, or should I say overthinking about things. This then leads to those annoying doubts and ultimately inaction. The way to get over that? Just do it. Seriously. Stop thinking, get out there and do it. You have to make yourself take that metaphorical leap because if you stand there and overthink it, you will likely back away and forget why you wanted to take that leap in the first place. After a year of indecision, I had a series of Just Do It moments where I knew if I hesitated, I would stop. 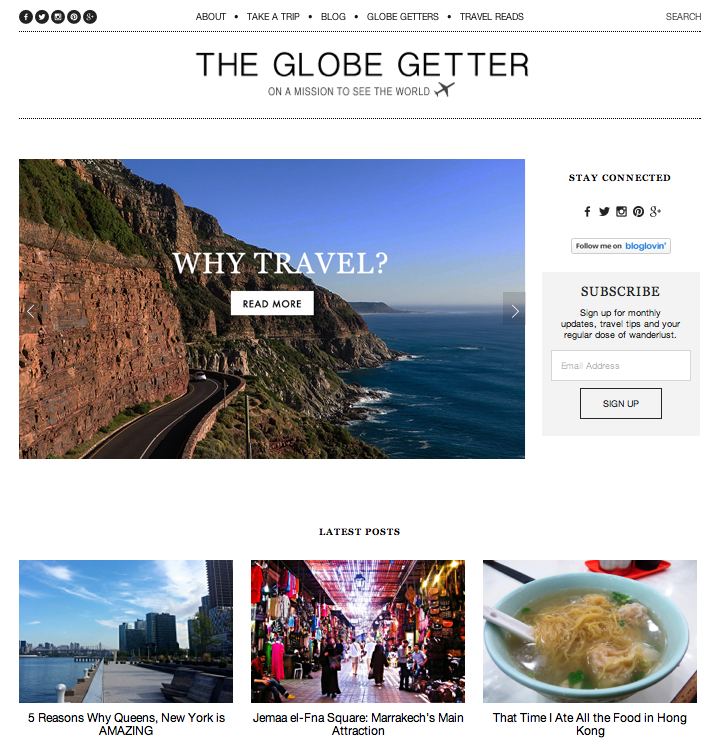 So, I bought the domain, built the design, wrote content, reached out to fellow travel bloggers and launched the site, all one right after the other without stopping until The Globe Getter was up and running. No turning back now.